I've been focusing on debut disks - just to make it more challenging for me. I don't think you'll care one way or the other, and I'm running out of decent debut disks. Yikes, I haven't done a Classics version since April. And it doesn't look as if I'll have a new music release for July. Such is the way of the world. Blobby's World. 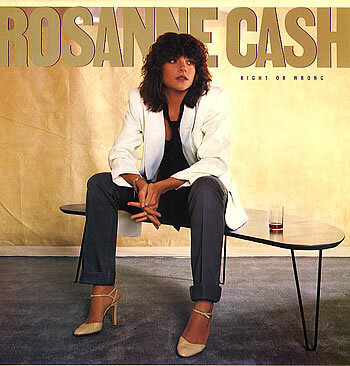 I'll finally do Rosanne Cash's debut - Right or Wrong, released in 1979. Technically, it's her U.S. debut. She recorded an album in Germany a year or so earlier that was a bomb, but she was bound and determined to not be associated with her father - Johnny. Even she thinks that album is abysmal. While Cash, oddly enough, wasn't raised that much on country music, she knew enough to record a disk that would start what would be called 'new country' - meaning not being so sad-sack with the country music ala the put upon woman done wrong by her man. Produced by her soon to be (first) husband, Rodney Crowell, he brings folks from his stint in the Hot Band which backed up Emmylou Harris - including Harris herself. Cash is green as a vocalist and songwriter on this disk, penning only one tune. Her vocals are decent but became much stronger over time. Still her voice suits the song choices. It's a solid debut disk, though not stellar. Crowell, being a prolific songwriter, gets four of his own songs in here - all good, especially "Baby, Better Start Turnin' 'em Down" and "Anybody's Darling". Cash's one turn at writing ("This Has Happened Before") is decent, but only an inkling at what she'd be able to turn out a few years later. It sounds like the disk was made on a shoe-string budget and while a few of her more successful disks got remastered, Right or Wrong did not - and it desperately needs to - though the limited audience vs the out of pocket expense make it highly unlikely Sony will ever do this. If you stumble upon it (the library, perhaps), it's worth picking up. While as you won't be wow'd you will most likely like.